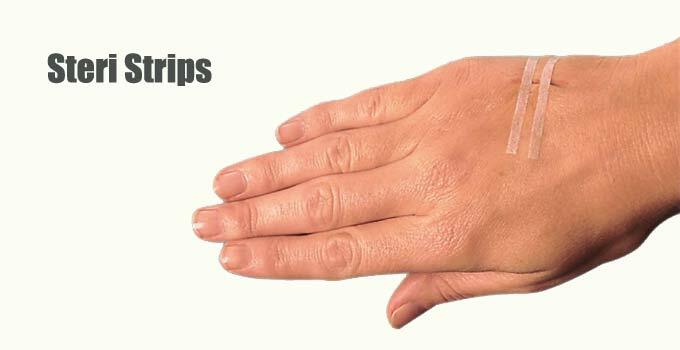 Wound Care & Guidelines when to use Steri Strips for closure or to Suture. Will I be able to actually sew myself back up if something happens that requires it? I’ve got the suture kits, steri strips, everything to clean the wounds or whatever, but, can I pull off stitching myself up? On the strips, there are two kinds. Butterflys and steri-stips. Steri strips come in 1/8″, 1/4″ & 1/2″ size widths. I believe butterflys are available in large and small. The depth of the wound is what matters with steristrips. – Less than 3/16″ deep probably okay to use tape (strips). – Above 1/4″ probably should be sutures. At 3/16″ it is iffy, tape or suture. With strips consider using tincture of benzoin on the skin next to but not into the wound. Tincture Of Benzoin, 4 FL.OZ. Allow it to dry and put the tape on one side and the pull to the other side to close. Start at one end and work towards the other. Close the wound as soon as you can. This will minimize infection. The rule in the ERs that I worked in was get to us within 6 to 12 hours. We might consider closing one that had been left open longer but probably not. The longer the wound is left open the greater the chance of it becoming infected. Close the wounds in layers. If you pull the edges together over a deep wound you might get an abscess under it. I’m not going to describe suture technique as I’m sure there must be thousands of online videos. They are essentially the same and come in 2 strengths. They may or may not have epinephrine in them. Epinephrine will reduce the wounds bleeding by constricting the veins and arteries around it. It will provide some numbness. The body will reabsorb the medication. The epinephrine will slow circulation in that location. Fingers, Toes and Nose are never injected with Lidocaine with Epi. Damage to tissue from lack of circulation in those places could lead to amputation. If a wound can’t be sutured it heals by granulation. It will slowly fill in from the bottom up. At least daily dressing changes will need to be done and the wound cleansed & observed for signs of infection. Not all wounds need to be closed with Lidocaine. First, lidocaine burns like crap when you’re injecting it and you have to inject it numerous times around the edge of the wound, When I was in Vietnam and going to sew some dude up I’d give them a choice. Most would not opt for the stuff that stings. I had an incident where I was building a shed and walked into a corner of the metal roof. I needed stitches and at the time I was without insurance. The equipment was available. I sewed myself shut in the bathroom mirror. It was kind of difficult as all the moves were backwards in the mirror. No lidocaine and the discomfort was only moderate, I expected more pain when I pulled the suture through the skin but it wasn’t bad at all. When removing steri-strips pull one side to middle of the cut. Then pull the other side to th middle. Then pull both sides up. Wounds take months to heal completely. Pulling the tape from one side over the wound and continuing to pull could pull the wound open. For best results when removing steri-strips and sutures remove every other one. If the area of the wound is looking like it wants to open, leave the remaining ones in place for another day or two. How Long to leave Sutures intact? I liked to leave sutures in scalp wounds for 5 to 7 days. Facial wounds, 7 to 10 days. Most other wounds 10 days to 2 weeks. The more a part bends the longer you need to leave them in. A cut in the middle of the forearm is going to get less bend than a cut on the top of your wrist would be an example. Use Medical staples where appropriate. I believe ‘Doom and Bloom’ sells them. Super glue can also be used for minor wounds. Use the medical grade. Nothing else available? 2 or 4# mono fishing line can be used as a suture material. Sterilize it first. Lastly, you need to be as clean as possible when you are doing surgery and suturing is surgery. Scrub the wound. Don’t drag the suture over dirty stuff, like the patients clothing. Consider draping the wound with a piece of plastic sheeting with a hole in the plastic where the wound is. Then spray the plastic with a disinfecting solution. Do you see pus coming out of a wound that has been closed? It’s time to go the doctor! If there is no doctor remove the sutures, treat for infection and allow to heal by granulation. Hope this was helpful and remember doing this to others is practicing medicine without a license and you could get in trouble for so doing. Therefore this is not medical advice. Just stating opinion from experience. [Ken adds:] You do have a general purpose First Aid Kit at home, right? AND take large amounts of vitamin c every 4 hours to bowel tolerance! I had to sew DH’s finger back on after a knife slip. Worked great. He healed very quickly once he maxed out his vitamin c intake. just saying! Trust me super glue will not kill you or your arm or hand will not fall off after using it. Have used it for years on construction site and commercial flooring and finish jobs. Had a doctor get all crazy on me about using it to close up bad cut from a sheet of P-lam. Told him I needed his private phone number so I could call him at 0300 to come down to a high rise in downtown Seattle to stitch me up. He said how about the germs? We use pure alcohol in our work and have you ever smelled super glue. No self respectable germ would go near the stuff. Use what you have on hand, adapt, overcome, innovate and survive. Have used regular super glue many times my self.Working as a machinest,and millwright,you get cut all the time.Of course,for those deep cuts,I head for the doc. Thank you for listing in easy order. Would love to be able to print it without all of the ads. Makes me wonder if I need to get a umm pig foot or something to practice on. I do not know if I can put a needle in anybody. Mr. said one of the hardest things he had to do in boot camp was stick himself with the syret (spell?) Although when he actually got hit in Vietnam, it all of a sudden was easy to inject morphine. Guess if a loved one is truly hurt bad all fear will disappear. Stitching myself though, whew probably not. Guess I would go for granulation. Funny, many of our ancestors just let it ride and made it. Guess with whiskey and what they had! Ink and paper are expensive and not easily available where I live. I copy the article to a Microsoft Word document. Then I format it. If any ads accidently get copied, including links to ads, I just delete them in the Word document. Then I format the entire article. For the least expensive format that still works with my eyesight, I format it to Garamond, 12 pt, 12 pt between paragraphs, all black, not underlined or italic, nothing bold, and 15pt between lines. If you see those settings will make just one or two lines on the final page, you can change the 15 pt between lines to 12 pt or the 12 pt between paragraphs to 6pt or 10 pt. Or you can adjust the margins to save paper. You can also adjust your printer options to economy printing and both side printing. I find that Garamond uses less than the other fonts available to me and that colored ink doesn’t go as far and costs more than black. Bold and underline use more ink, and all those features that I get rid of detract from easy reading. When you are finished, you can save the document as a Word file for easy access. I’ll second what DaisyK wrote. I wanted to print out this article for my 1st aid reference materials, so I highlighted the article on screen, and did a copy and “Paste-special” onto a blank word document, then selected “unformatted text”. After it came up on the blank Word page, I just went though and cleaned up the spacing a little bit to tighten it up. I got the entire article (no ads) down to 2 1/2 pages, and may have been able to get it down to 2 pgs if I had been willing to spend a few minutes on it – 2 1/2 is good enough for me. The only thing I don’t have is the photo Ken has at the top showing the strips on a hand. That is so cool. I didn’t have to undo all the background shading, distracting underlining & coloring, etc. I have some friends (two friends and one brother) who are computer illiterate and don’t have computers, email, smart phones, etc. I am always printing out articles and other things I think they would be interested in and mailing them. This is much better than my slow method. You are so welcome – glad it helped!!! Not exactly as fancy as your instructions, but got it done! There is a website called printfriendly dot com that is easy to use. Just copy the web address of the page you wish to print and head over to the printfriendly website. Paste your web address into the field on that site. You’ll end up with a the page where you can delete sections from, narrative or pics or ads. Then you can choose to save as a pdf or print out. It’s very handy and free to use. I’ve used for a couple of years and love it. You can use a chrome add on called Print Friendly & PDF. It’s free and allows you to “print” web pages to PDF. Thank you for the info, wound care was a necessity pretty much all my life, we always lived out in the sticks and spent a lot of time even further out, luckily we never had anything serious, Gods grace i suppose. Its funny really because there were so many cuts and stuff that we just shrugged off and i still do. Been lucky i guess. Usually, those branding parties include vaccinations, and castrations. Maybe that prairie oyster lunch was not to their liking. Yes, and rooster fries from the coop! Don’t get angry with me if I say the obvious – avoidance of injury is much easier than “a do yourself stitch job”. Many years in construction have proved that, for many jobs, a pair of good thin gloves can really help. In many cases, those mechanics gloves prevent a lot of slips and hand injuries. It is too easy to get in a hurry, get complacent, or get over tired. Serious injuries like saw cuts, saw kickbacks, bad falls, … are beyond do it yourself treatment except for initial first aid. The next next type of serious injury I witnessed was, two people, each losing an eye in a six month period. Both were hammering on some concrete – you know, just wack that form or break the piece of wood free. So, eye protection is very important – but we dodge that bullet each day because it is easy to move from task to task without a change in safety attitude that should be considered for that job. Then there are the treatments no one wants to touch – I actually backed into an old timber and got a deep large sliver in my rear end – not one tough guy on the crew wanted to go there – had to have it removed at emerg. As it turn out, it was too deep for on-site treatment. That’s an excellent point to avoid gettin hurt. When I was younger, I didn’t worry too much about gettin injured. Now I am constantly thinkin how not to get hurt. I do find it helpful to think it through and remove any potential problems I can. On another note, if someone is injured it is paramount to do your best to remain calm. I have witnessed an experienced nurse and a fairly seasoned emt come unglued when confronted with family injuries in their off time. I have been sewed up several times. I have also had a few cuts, blunt force injuries that should have been sewn. They all healed well without stitches, maybe little more scar than if stitched. As long as the wound bleeds well, then slows way down or stops and its managable from a size and location standpoint, I don’t worry too much. I keep a close eye out for infection. I keep it clean, if it’s drainin which it commonly does, only cause it’s an open wound, I keep a clean dressing on it, once it scabs over the worst for me is gone. What I mean by this, gettin sewed anywhere, dr’s or especially shtf the risk of infection is serious. I don’t partake if I can avoid it. We sure don’t need any needles stuck in us if shtf if we can avoid it. I am not a dr, this is not advice, it’s just my humble hillbilly opinion on the matter. Hermit, I know what you mean, I bet them tough ole construction boys scattered when you started “bringin up the rear”. Three years ago I broke my ankle in the snow. Moving out of the way while Mr. moved the van so I could in. Deep snow was over my boots. I hit a low spot in the drive and broke my ankle. There was nothing to stop the fall. I remember the POP. From time to time I wonder what could have been done had there been no hospital. I did not need a cast or surgery thank goodness. One supposes if the break had not been clean pain might be an indicator of a really bad break. What do you do if you break a limb? How would you know if like myself all you had to do is stay off of it. Not to mention that crutches and a 63 year old woman are not a great combination! Mr. got me a knee scooter. Could not have done without it!!! Thank you to Nailbanger for asking the question, and especially to “me” who took the time to give us all such a detailed answer & explanation. I very much appreciate the info! The RN’s taught me it has to be cleaned every day with saline solution after removing the old packing material. Then replacing the material strips but never putting in so much that the hole is over done where the tissue can not grow each day. This procedure had to be done on dh every day but the RN’s only came 3 days a week so the rest of his care fell to me. Amazed at all that I learned during his surgical recovery. This is on a ‘granulation’ wound that requires time to heal. I to wish I had read this article a while ago. We live 70 miles from medical help and a way off the grid, grizzly adams came over with a bandage half on. He slit his finger working with metal roofing down to the bone and wouldn’t go to the hospital. I have sutured a pigs foot about 2 years before and of course remembered nothing about it. And a pigs foot isn’t bleeding and was only slightly more hairy then he was. It had been bleeding for about an hour and he just got it stopped. Afraid it might start to bleed again, I poured peroxide over it, filled it in with almost a whole tube of triple antibiotic and wrapped it until it was about an inch wide on both sides. That tape that sticks to itself is great. It turned out great thank goodness. He was most worried about it being his trigger finger! Since then I now have most of the things in the article. Old lady. ,,,,,,get a stapler !!!! And a staple removal tool. Camping survival has them. Thank you for the great post and information. No matter how careful you try to be sometimes bad things happen. My major concern was if a SHTF situation occurred, and medical assistance wasn’t available in a timely manner or destroyed. Having the information, ability, and medical tools to treat yourself and others just makes common sense to me and is a primary part of emergency prep. That’s why I bought the suture kit and lidocaine. If I never end up using it I’ll be happy. My First Aid kit is more advanced than the normal basic ones with bandaids and antibiotic gel for minor injuries. I would gave elaborated a bit more if i knew I was doing an article! I just touched on the basics and there is a lot not mentioned. A few more bits. Wound type has to be considered also. A long shallow laceration versus a short and deep one. A cut across the tip of a finger might be pulled to together with a single steri-strip and be good to go with a bandaid over. As I mentioned yesterday avoid encircling a finger as it impedes circulation. Steri- strips are about 3 inches long but there is no rule that says they have to stay 3 inches. If a shorter one is needed they can be cut to length. Steri-strips are on a paper backing, Cut between the strips to get the amount of them you need. remove the wide piece of paper and leave the papers on the ends will allow you to place multiple strips at one time. Obviously you remove the paper on the ends after the wound edges are approximated or pulled together. Some providers will advise the patient to leave the strips on until they fall off. They will usually start to come off on the ends and it is fine to trim the ends. Getting them wet is more problematic than with sutures. Benzoin can be applied over the strips to give them a bit more water resistance. Sutures should be kept dry for 2 days. After that it is okay to wash them but the wound should not be soaked. Shower preferred over bath kind of thing. Hydrogen peroxide (not food grade!) and a cotton swab can be use to gently remove scabs. Scabbing will make it harder to remove the stitch. Leave the ends of the knot kind of long to make suture removal easier. The ends of the knot should be to one side of the wound not over the middle of the wound. When removing the suture lift the knot and slip one end of a sharp pointed scissor blade under the knot and cut close to the skin. You want to avoid pulling suture that has been lying on top of the skin for a week or so through the healing wound. A number 11 scalpel blade can be used to to cut it instead of scissors. No scalpel, consider adding an xacto knife to your kit. Be careful to cut only one side of the knot. cutting both sides could cause the long end to retract under the skin. You don’t want to leave suture under the skin. Except for absorbable suture. Types of suture are either absorbable or non-absorbable and further divided into synthetic or natural (biological in origin). Most sutures we are familiar with are synthetic and non absorbable. Typically a nylon or polypropylene material and used frequently in the ER to close most simple lacerations. A natural suture example would be silk and this is usually considered as non-absorbable. Silk will rot but does so very slowly. It has to last through extremes of weather when it is spun by the lowly caterpillar so for practical purposes it is considered non-absorbable. Absorbable suture is typically known as catgut but isn’t from cats. Mostly it’s from cow intestine and is treated with chromic salts (think tanning) to slow the rate at which it is absorbed. You will frequently see it listed as Chromic or Chromic Gut. It can be used in place of non-absorbable if you are not worried about keeping it in place for long periods. Typically it is used under the skin. Example would be a surgeon connecting a severed artery or vein back together or tying around a small artery that is bleeding and needs to be stopped. It gets really serious here. Tying off a bleeding artery can cause significant damage from lack of blood to tissue normally supplied by the vessel. This is one of the wounds where you want to have somebody more qualified than me. A synthetic absorbable that is commonly encountered is Vicryl. Using non absorbable suture under the skin could could cause problems. It should be avoided. Suture comes in different sizes. Smaller sizes are expressed as ought or O. a 3/0 or 3-0 is larger than a 5/0 or 5-0. If you here the doc in the ER ask the nurse for 3 “0” he or she is asking for 3/0 or 3-0. When you get into the regular numbers the suture gets bigger with the increase in numbers. I think the most frequently used suture in my experience has been 3/0. I would stock that and maybe a some 5/0 for more delicate work. 3 silk for major pulling on a large laceration might not be bad to have also. Needles are either attached or have eyes. I would recommend having both. Most commonly used kind is a half circle. This allows you to start on one side of the wound and continue on into the other side. The will usually come through and can then be picked up for tying. A typical needle holder is nicknamed a driver. It looks like a hemostat but typically the jaws are smooth or cross hatched. Needles attached to suture are not reusable, eyed needles are. You want various sizes as deeper wound require deeper placement of the suture. Look on eBay for reusable needles, there are many and they are cheap. I don’t know about Amazon. You want to avoid pulling the top of the wound closed over a pocket as this is an invitation for infection. Not all wounds should be closed. Skin tears are commonly seen in the elderly. I hate to admit to it but I don’t think of myself as elderly. Most people younger than me would disagree. A skin tear occurs when the top layer of the skin (the dermis) separates from the layer it is attached to. It happens a lot with falls. The skin rubs against whatever you’re falling against and friction separates it from the underneath layer (the epidermis) this then rips and will usually remain only partially attached. It is to thin to suture and the tissue itself does not have enough blood supply for viable healing. An ER might put a few light sutures or steri-strips along the edge to try and keep it in place as a cover while the under-layer heals. For the most part a lot of the tissue is going to slough off in the near future. Deep stab wounds are often not closed as they are likely to infect. They will drain the infection better if there is an opening. Most small puncture wounds do not need to be closed either, stepped on a nail kind of thing. Bites are in the same class unless really major. In that case lightly suturing it back together could be considered. Another technique that is rarely used is a hair tie. I’ve done it once and seen it done maybe 2 other times in many years. this is used for a simple scalp laceration. hair on either side of the wound ii tied with a surgeons know to bring the edges together. A surgeons knot is a modified overhand knot. Numerous online diagrams demonstrate it. It is a semi-useful skill that you probably will never need. The above is from my past experiences as a medic and ER RN. As a medic I was allowed to suture. As a nurse I wasn’t but did have to prepare the patients for suturing and then dress the wound. Afterwards I instructed them on wound care. when they returned I’d remove the sutures or staples after the doctor had seen them. I’m no longer a licensed health care professional and therefore the above is mentioned for information only. Suturing is technically surgery and preforming it in most instances could be seen as practicing medicine without a license. As far as I know that is a felony in all states and could land you in jail, get you sued and preclude you from owning firearms. Thank you again for all the info you’ve shared with all of us. I have some steri-strips and a small suture kit in both my big 1st aid bags, and some strips in my GHB, but your add’l info and explanations have inspired me to stock a few more. I also have the Bloom’s book to refer to if need be. I hope it never comes to that – but better to at least have a bit of knowledge, just in case. Has anybody read The Survival Medicine Handbook that is advertised on this site? I also have done a fair bit of field surgery as a Army Combat Medic and Operating Room Tech as well as assisting Veterinarians with large animal’s. However I was wondering if I was incapacitated how well my tribe could patch me up. Thus wondering about that book. Opinions anyone? Worth every penny. It is in my library. This is the book put out by the Doom an Bloom folks. i also have the survival medicine handbook, that’s the one I didn’t mention by name in my post above. Love it – and it is written to address people who are prepared, not just Medicine in general. Actually your input has really opened my eyes on this subject. I now realize I am still a babe in the woods on this subject and need more information and training which I will obtain. Sometimes I tend to feel we forget about medical issues for preparation and survivability with most of us concentrating on food, shelter, fire, and water. About a year ago I looked at my store bought family first aid kit and thought, this is really lacking in supplies for medical issues I might encounter in an actual SHTF scenario. I then started assembling a better more comprehensive kit that covered serious trauma, wound management, antibiotics, pain relief, etc. I bought basic military IFAK supplies first, and added on from there reading about medical issues that have occurred during recent disasters. I also completed several advanced first aid courses. I remember when I was in the service our first aid pouch consisted of nothing but a bandage. Today’s moderm soldier has an IFAK that is so much more advanced. At a minimum I think each of us should have an IFAK for each person in our survival group along with more advanced supplies, and the training in how to use it. It doesn’t do any good to have medical equipment but no knowledge on how to use it. I’m still learning and assembling supplies ‘just in case.” Your information on suturing techniques, and suture types is invaluable. Thank you very much. I posted this a few months ago. In an estate buy we found a real WWII first aid paper from a kit in the Air Force. There was no penicillin then so in their kit was sulfonamide powder. The instructions were to put powder on wounds and take the powder etc. Guess many vets made it home using sulfur. Of course we have “better” today. Old lady, you just reminded me of something I wanted to mention. Cut to the bone can be serious. Bone that is even just scratched by an outside object is at risk for an infection called osteomyelitis or bone infection. It can be very serious. All wounds where the bone is exposed need to be treated as infected with the proper antibiotics. Sorry I can’t advise which ones on this subject. AC your broken ankle was most likely a fractured fibula which is the smaller leg bone in the lower leg. Frequently they will heal by themselves and may not need to be “set”. A loose rule of thumb is you can walk on a fractured fibula but not on a fractured tibia. I did have one patient who came in who hadn’t heard the rule, We were amazed that he walked in. I also had a patient come in from an automobile accident with a laceration on his calf. I talked the doc into doing an x-ray. She wanted to know why and I said he has a laceration yet his pants leg is not cut. Fibula had fractured and come through the skin then went back inside. Closed fracture versus open fracture with risk for osteomyelitis. it was one of my better calls. Avulsion is a wound where a piece has been removed and there is nothing to sew back together. My step son cut the pad on the tip of his finger off and couldn’t get it to stop bleeding. With no edge for a clot to start on it just tends to wash off from the bleeding underneath. The Celox granules worked fine and he got several packs as a ‘Christmas gift that year. Available from Camping Survival. It should be in our kit along with the various other Quickclot bandages. Yes the small bone and I healed as quick as a youngster. Still a wrong step could have made it worse so I followed the Phys. Assistant to the T.
Ken, If you had wanted, I could have sent you the picture of my finger from last month (which I think may have indirectly had something to do with this). I might add after the cut, before suturing or taping, keep applying pressure to the cut, if possible (most cuts should be small enough in length to allow this). A sterile layer in between is ideal, just try to make sure you don’t impress it into the cut itself. I have a nice suture kit along with the butterfly and steri-strips in our first aid bag at home. I also keep those in smaller kits in our BOBs. In my GHB, I keep some banddes, steri-strips, along with an Israeli bandage and regular bandages…don’t have a suture kit in that bag, though, and maybe I should rethink that. Also decided to read up on your suggestion of the tincture of benzoin (which I do not have). I learned that benzoin is beneficial with foot blisters that require moleskin protection and that the benzoin is an excellent adhesive. It’s sold at Amazon in ampules for application and looks like a worthwhile purchase. Thanks for the tip! there are expiry dates/best before dates on packs of first aid kits / first aid supplies. are these just to encourage you to chuck them, or do bandaids/sealed metal foil pouches etc, actually expire? I don’t pay much attention to expiration dates on medical supplies. some of this stuff just doesn’t go bad. A bag of Normal Saline solution has water and plain old salt in it. I’ve never heard of water or salt going bad if the bag is kept intact. As for a pack of gauze dressing pads if the paper envelope has been kept dry I think that they would be fine also. If bandage materials are questionable baking in an oven at over 220 degrees is probably adequate to kill any bacteria. I haven’t used expired suture and I don’t know about heat damaging the material. If it was all I had I personally would use it and suture packages do have expiration date. Should have clarified an IV bag of saline soution or a plastic bottle of saline for irrigation. thank you. pretty much what I was thinking. There is another, less threatening, method of closing a wound that everyone, even some children can accomplish without too much of a problem. 4) using 2 strips of duct tape, fold one back on itself and apply the other end to the skin on the butadiene. Be sure the ends on the duct tape have space between them. 6) suture through the duct tape and carefully draw it up until the wound edges meet. Like lacing your shoes or a corset. No poking a needle through skin or anything else that will cause some to faint or throw up. But it’s effective and you can use several if the wound is long. More than one way to skin a cat my dad always used to say. Sure messed that up. Fold one end of each piece of duct tape back on itself, making a place that will not stick to the skin and is double strength. Also, use Benzoin if you have it. Butadiene is for clening skin before surgery, brain dead for a minute there. General information acurate and workable in bad scenarios. You can even use a regular sewing needle and dental floss the the sewing materials, again worst case scenario. What you are describing are improvised Montgomery Straps. Not commonly seen now but used a lot back in the day. Mostly we used them for frequent dressing changes after abdominal surgery. The incision was also sutured after surgery. Instead of suture we used bandage as a cord for holding dressings in place. Sort of like lacing up a shoe. We could change the dressings frequently with out having to rip tape off. I see no reason that they coudn’t be used for holding wound edges closed. We had guests last night and the young man was telling me he had inherited his grand-fathers first aid kit. In it was a device similiar to the Montgomery Straps. Two pieces of tape which you applied to the wound edge with a zipper attached. Put the tape on and pull the zipper up to close the wound. It was a completely new thing for me, I’d never heard of it.